← PNO is right about the Phoebe. Ever since the suggestion was made I’ve been kicking myself for not thinking of bolting a wider shelf up there. Never really occurred to me that she’d come back to that spot, to be honest. Too late now, but I guess if she thought it was too narrow she wouldn’t have come back. So is Laddie continuously serenading her? Or does he only occasionally bark her praises? You’ve done your part in the helpfulness department simply by erecting the structure as it stands now. She found it acceptable by her own criteria – which she probably hasn’t shared with you. There probably will be a time she’ll appreciate your helpfulness. When you see a raven or owl hanging around and showing an undue interest – your presence may deter a raid. Likewise with a Bull Snake – they are incredibly capable climbers and you may sometime find one 1/2way up your wall. You’ll know when she’s in trouble – you’ll hear the alarm cry and eventually wander over to see what the commotion is once you start to realise the context. She has a good idea of what will prey on her young and that site met her criteria. The overhang should prevent larger birds from easy access and the sheer wall will challenge the snakes. What she would probably like is an abundance of juicy flying bugs – could you arrange for that? The idea to add an easy shelf has merit but I’m going to leave things as is for now. If I’d thought about it before she showed up I’d have done it, and I still might later in the summer when the babies are gone. But for now I’m going to leave her alone. You’re absolutely right! That’s been bugging me all day but I never gave it enough thought to see why. You’ve got 11.5 months to do the engineering and construction, so I’ll open the task list with a suggestion: Assuming the rafters are on 16″ centers, that’s 14.5″ between internal faces, 17.5″ between external faces. A piece of aluminum 12″ long and 6″ high bent into an L-shape alng its length produces a piece 12′ long, 4.5″ high, 1.5″ wide below the bend; screwed to the external faces it provides an open lip 1/2″ high and the width of the rafter into which is slid a piece of 1/2″ plywood or OSB 17.25″ wide and 12″ long, forming a platform for nesting. Along the back edge of the plywood fasten a 14.25″ length of 1X or 2X stock equal in height to the distance between the slide-in platform and the underside of the roof. 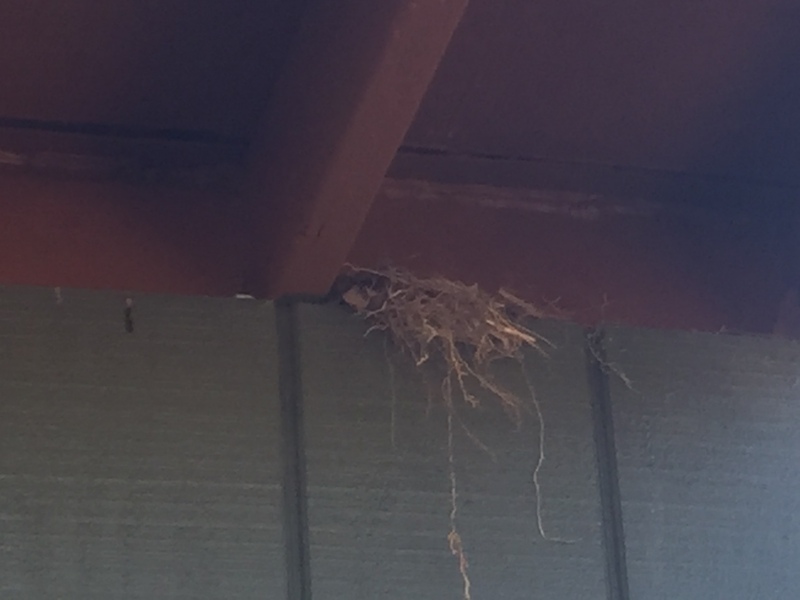 This prevents material (and small birds) from falling off the back of the platform and allows easy removal of all material when the platform is slid out after departure of your guest (removal prevents interlopers from using the Preferred Guest’s quarters in the off season). The NEW! IMPROVED! version has a knob (or small wood block) screwed to the underside for easier insertion/removal, and the lip edge of each of the bent aluminum forms is drilled for a small wood screw to secure the platform against wind or overly rambunctious nesters. @ T-pod RE: Over-engineering. Since I’m retired I no longer over-engineer things for a living, now it’s just a hobby, and turning a simple shelf into a Golden Gate Bridge-level project helps pass the time…. But…however it’s accomplished, there’s a benefit to having the nesting shelf removable, both for post-Phoebe cleaning and to prevent other birds usurping her spot. I’ll not deny there are simpler ways to accomplish that than I offered. I have full confidence in the ability of the Engineering and Construction Divisions at Desert Hermit, Inc. to come up with Something That Works For Them. So maybe a floating shelf with removable (un-screwable) support struts? Probably should have a mosquito-net screen around it too. A/C might be a bit much though:-D.